Another musical interlude, here at Radio Free Maganmund! This time I have unearthed some glorious 8-bit cover versions of every gamers favourite 80's Grindcore band: Bolt Thrower - Enjoy! Epic tunage variously programmed by Robert Nocturne and Insidious Warfare. Today (I know, Sunday, since when do Amazon do their own deliveries, not like I ordered it next-day or anying, just standard free, whatever, with a bunch of other stuff...) I received Michael Scotts Irish Folk and Fairy Tales Volume 2 - long rumoured, suspected, suggested (thanks Robin) and indeed confirmed (thanks Graeme) to be the source material Graeme Davis discussed on usenet in 1998 which he had feed to the the Citadel Design Team, during the early stages of developing the Fimir, back in what must have been 1985 / 86. The back cover features this odd cycloptic denizen of the mist-srhouded forest to be clearly what we now consider to be a Fimir. The head perhaps a little more bulbous, the cape slightly more Draculaesque and the armour a little less decorative, but non-the-less, the one-yellow-eyed fellas thick prehensile tail, toothed beaky maw, stooped pose, sinewey arms and the suchlike firmly show traces of the same dna. 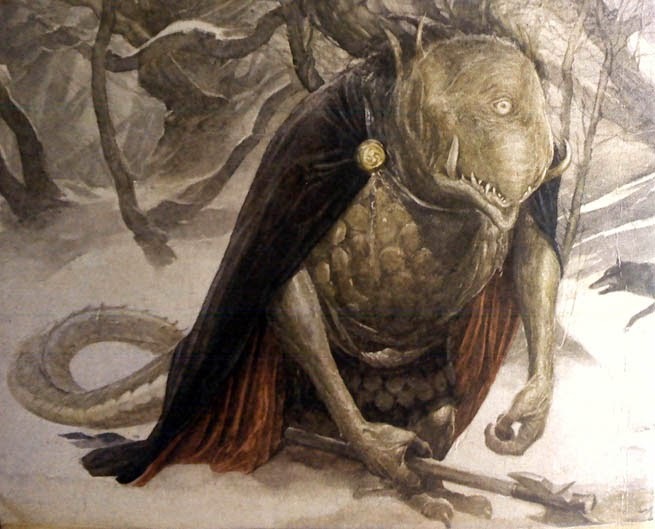 Origin of the Fimir part II, where we gaze upon some potential influences on Alan Lee's depiction of the Formorians - mostly focussing on his good friend, one time collaborator and studio mate, Brian Froud, through his work with Jim Henson on the Dark Crystal (1982) encompassing both the Mystics and the Skeksis to designer and illustrator Michael K. Frith. On refelction Lees formorians do look like a more earthly and rational UrSkek, perhaps a 'working out' of what could have been. Friths works include much Muppet character design including the proto-muppet Scred from Land of Gorch / SNL (1975). Frith worked with Dr Seuss early in his career, so who knows, there might be some ur-proto-fimm dna lurking between the Green Eggs and Ham. 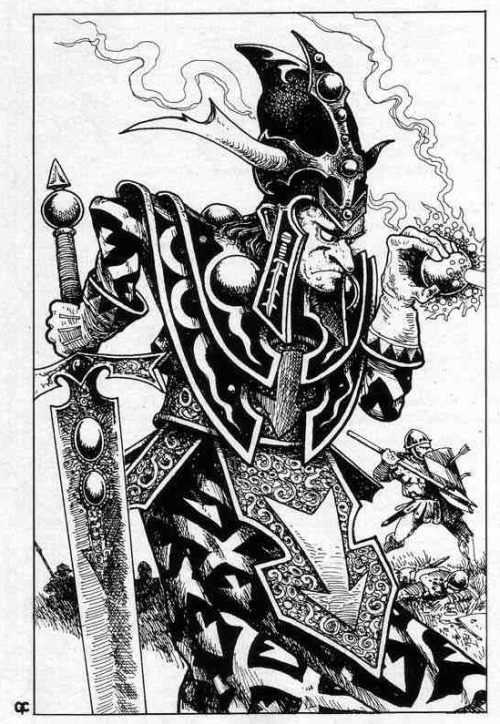 ...and Origin of the Fimir part I, where Alan Lee revisits Formorians in Castles (1984), and the Games Workshop design team get the brief, in time for WFRP (1986) and 2nd Edition Warhammer Fantasy Battles Ravening Hordes (1987). Welcome to Radio Free Magamund, wherein I listen to stuff whilst doing other things, then write about it. Here we are listening to the second part of the audiobook of the novel of the gamebook adaptation of Lone Wolf Legends: Eclipse of the Kai, by Joe Dever and John Grant, read by Edward DeSouza. ..takes command of the little troupe. The Giaks have a low, cunning intelligence, and their barking voices are quite well by DeSousa. Further along the way he does some strawberry flavoured Giak drugs which make him invulnerable to pain or something. On his way, just out of the city - Banedon encounters Alyss. She seems to be the sun-dancing cosmic being we met in part one, and to be both something of a Mary Sue of Elminster-size proportions and a Manic Pixie Dream Girl. The 1990s saw the emergence of Girl Power, and post/ third-wave feminism, but Alyss unfortunately doesn't seem to be informed by this. She tells Banedon that she hopes he likes the form she has chosen for him - an interdimensional sub-goddess being who gives her self a shape to please a man. We know her nut-brown skin and reddish hair, and long limbs, whereas I recall nothing of the appearance of Banedon or Silent Wolf. Alyss super-powered hyper-perfection makes her immediately alien, remote and distant, and all the problems of over-idealised female characters come with it. It's like the DMs girlfriend turns up to a game and he hands her some straight-18 level 27 Paladin-Sorcerer-Acrobat to play and the other 2 players have a level 1 Wizard and Ranger that their roles barely qualified for. But when this perfect specimen of trancendental elfin femininity is voiced DeSouza trying to do a playful, lighthearted girly-girl voice, the whole thing just becomes weird but unfortunately not in a good way. If she turns out completely irrelevant to how the rest of the story pans out, we could safely delete these scenes and improve the overall quality dramatically. Full points for DeSouza for the attempt, at no point does he break down in laughter, but it really doesn't work. The background music (by Joe Dever) in this scene is quite good, acoustic guitar and synth base, lending something of a pastoral feel, but we learn nothing about Banedon other than his gawkwardness in the face of a charming playful demi-goddesses, and nothing about Alyss other than well, she's a one dimensional Super Girlfriend Manic Pixie Dream Girl who can not only remember the future, fly into space and well, do anything. Which unfortunately centres on Alyss who, disguised as a Drakkarim, has infiltrated the castle of the multi-mouthed, Giak munching Lord Zargana trying to convince him to wait until next year to invade Sommerland, due to lack of weapons for his Giak army. Actually the scene of political intrigue plays out quite nicely, shown the absolute fear the Drakkarim have of their master, along with his small minded petty evilness power. It helps that Alyss is masking her voice, so DeSousas female impersonation routine isn't as jarring. Which of these would describe herself as kooky? Advice from an underling of course , infuriates Lord Zargana so much he determines to send a bunch of Giaks to kill the renegade Drakkarim in her sleep., but of course she's so totally awesum magical she just like totally vanishes, convincing Lord Zargana that she was a spy all along, and to invade Sommerland sooner, rather than later. A note on the miniatures, I believe these wonderful old-school models are from Joe Devers personal collection, which can be seen on the site of the current Lone Wolf publiher Mantikore. For your listening pleasure, the HeroQuest soundtrack. HeroQuest soundtrack was composed by Barry Leitch. At turns wistful and melancholic, HeroQuest is oddly downbeat for its role-play-lite dungeon bash. While Heroquest was a multi-platorm release (Amiga, Atari ST, and PC) and these doubtlessly allow for greater subtlety of sound the constraints of 8bit gives it a darker edge - and there is something about the confines of dungeons and minimalism, be it the narrow multi-choice of gamebooks or the ANSII graphics of nethack, or the restricted physical spatial configuration of the Heroquest board. While, the eletronica of proggy synth-based horror music soundtracks from the 70s and 80s - the likes of John Carpenter, Goblin are firmly stuck on the dungeon-crawl playlist - they have a kind of cold sparseness that permeates the sound, that is amplified by the reduction into 8-bit computer music. and to complete the thing here's Shriekbacks frankly full on post-punk proto martial industrial 40k pop hit: Nemesis.